I have a confession: this weekend was Mother’s Day and I phoned it in. Literally. Sushi one night. Pizza the next. Hot dogs at the baseball game. A steak dinner made by the Hubs. Some good eatin’! So it’s time to get healthy(ish)! A friend of mine emailed me last week, and told me my posts have made her feel badly because they looked fancy compared to her more simple meals. Truth is: everything about dinner in our house is about being simple. And, as is probably the case in your house, we have our regularly-scheduled share of chicken nuggets, and hot dogs, and grilled cheese, etc. Also — I’m a TERRIBLE cook. I screw meals up all of the time. But I like to try. And trying new meals has become a bit of a hobby for me. But I’m no gourmet. When I make something that looks a little more complicated, trust me — it isn’t! It’s all about meals that come together easily and cook with little oversight. Tonight’s dinner is a perfect example. My 6yo had a friend over for a play date and dinner tonight. 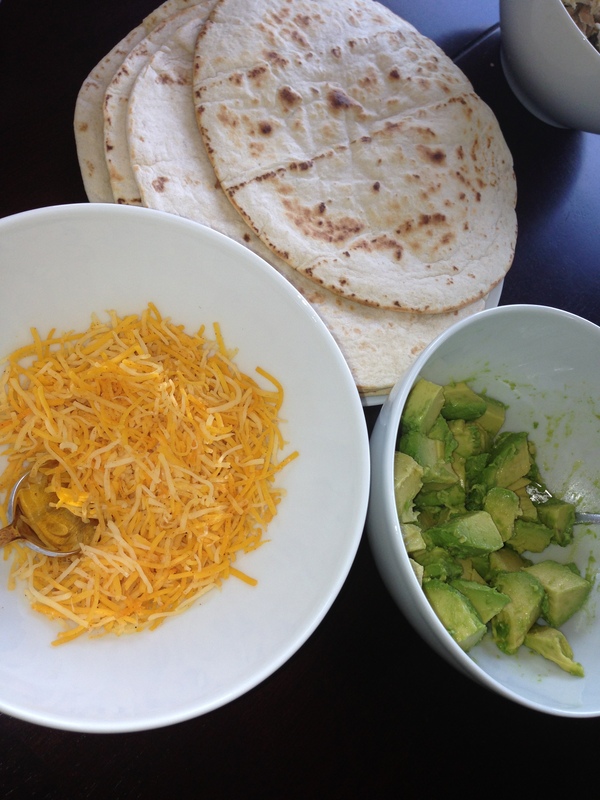 So I made a favorite for my kids: Make-your-own Chicken Soft Tacos. Turns out, our friend liked them, too. He had two helpings! They’re really tasty, and there’s something the kids really love about having a hand in how their own dinner comes together. (Forgive me for not having more pictures, but I had an extra mouth I was feeding during tonight’s meal.) LOL! The recipe? It’s one I found in a People Magazine — adapted from Sheryl Crow’s book ‘If It Makes You Healthy.‘ Here you go — it can’t be more simple than this. Poach the chicken while you hang out with your kids. In a large saucepan, bring stock and salsa to a simmer over medium heat. Add the chicken and simmer covered, until tender, about 1½ hours. Remove from pan and cool. Reserve cooking liquid. Shred chicken and put it in a bowl. Drizzle with enough of the cooking liquid to keep the chicken moist. 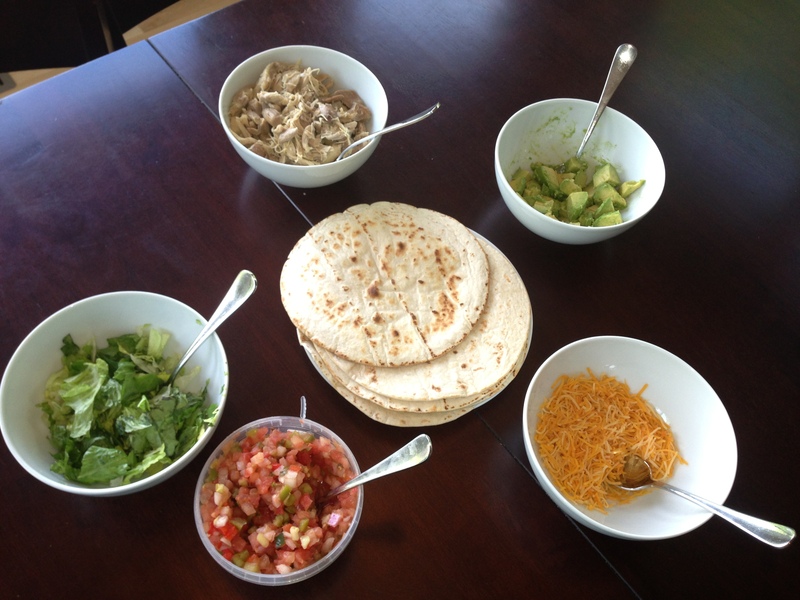 Fill taco shells or tortillas with chicken and top with lettuce, tomatoes, cheese and sour cream. Muy bueno! The kids love these! And — honestly — they’re so simple. Go ahead and give these a try! I’d love to hear what you guys think!